Integra partners who source through Telarus can now see buildings that have been pre-qualified for new fiber construction. Telarus, Inc., distributor of commercial data, IP, voice, and cloud service and patent holder of real-time carrier quotes, today announced that it had successfully added Integra's on-net and near-net building lists to GeoQuote, its patented software program that qualifies and prices commercial data and voice products in real-time. The successful integration opens the door for the Telarus partner community to find and price high-capacity broadband and IP transit opportunities that reside on or very close to the existing Integra fiber network. "Integra's fiber is something a lot of end-users are looking for," commented Lanny Gray, VP of Business Development for Telarus, Inc. "Giving our partners that ability to not only find the locations where the fiber exists today, but could exist tomorrow for a predetermined customer size, is a major leap forward in our ability to distribute Integra’s award-winning portfolio of IP products." 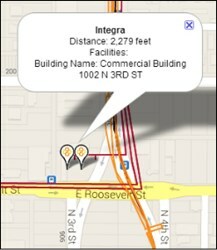 The on-net and near-net integration allows GeoQuote to accurately display pricing options for addresses that are currently in service, attached to Integra’s metro fiber network, or close enough to justify a fiber build. The project took several months of research on Integra’s part to assess which adjacent buildings would be serviceable and at what price points the ROI makes business sense. "It's all about knowing who your future customers are," added Tom Weaver, VP of Channel Sales for Integra. "We believe that our partnership with Telarus will give us the chance to communicate to the market through our channel partners where we are willing to extend our network to the new customer based on a minimum revenue and commitment. Having these rules in place, combined with GeoQuote's ability to accurately present this information to independent consultants looking to source Integra’s metro Ethernet services, greatly increases our visibility in the marketplace and helps us continue to expand our network in a profitable and measured way." Telarus' web development team first integrated Integra's SMB products and pricing into GeoQuote in 2010, just two months after signing a distribution agreement. Since then Telarus has integrated T1, PRI, and Ethernet over Copper availability and pricing – including applicable discounts – to the patented online pricing tool. "The completion of the Integra on-net/near-net initiative integration into GeoQuote means our partners will have an advantage over others not in our channel," noted Robert Butler, VP of Sales. "In commercial telecom sales, speed is the name of the game. Using GeoQuote, our partners will know where Integra is currently, and where they can build, all without having to pick up the phone or email a channel manager. The information is right there at their fingertips, making them look good to the end-user and drastically improving the sales experience – everything an outside sales partner needs to be successful in this business. Kudos to our internal IT development teams for pulling this off, and to Integra to providing the info we needed to complete this project." If you are interested in selling Integra's award winning metro Ethernet services and gaining access to Telarus' patented GeoQuote fiber pricing tool, contact Austin Holverson at 877-346-3232, or apply online to become a Telarus business partner at telarus.com. Integra is one of the largest facilities-based providers of communication and networking services in the western United States. We connect businesses of all sizes with advanced networking, communications and technology solutions in 35 metropolitan markets. Integra owns and operates an enterprise-class network consisting of a 5,000-mile long-haul fiber-optic network, 3,000–miles of metropolitan fiber and a nationwide IP/MPLS network. Our fiber network connects directly to more than 2,300 enterprise buildings and data centers. Through our expansive Ethernet-over-copper footprint, we can deliver high-bandwidth services to more than 400,000 businesses. At Integra, we understand our customers need reliable, secure and flexible solutions delivered with unmatched expertise and quality of service. For more information, visit integratelecom.com. Telarus, Inc., a value added distributor that holds contracts with the world's leading commercial telecommunication carriers, makes it easier and more profitable for solution providers, VARs, and MSPs to sell and source voice and data WAN solutions. Our patented GeoQuote platform combines real-time carrier pricing with advanced research features and branded proposals. Telarus' experienced Sales staff is strategically focused on enterprise WAN and high-capacity bandwidth solutions, making it easier to find the best offer, every time. For its part, Telarus has been named the top Master Agent by the members of the Telecom Association in each of the past three years, the first and only company in the carrier channel to accomplish this feat. Whether you are a top producer or a voice-and-data expert just starting out on your own, there is a place for you in the Telarus community. For more information on the Telarus partner program, please visit telarus.com or call the new partner hotline at 877-346-3232.